Can you believe that Memorial Day weekend is upon us? It's so crazy how fast the spring months just blew by and here we are at the cusp of the beginning of summer. I am so excited for what this summer will bring. It's our first summer where Cora won't be in school/daycare and so it's going to be a bit of a different routine. We've got her in a handful of summer camps but there are quite a few weeks where she doesn't have camp and so it'll just be me and her during those times. On one hand I'm ready for all of the fun we're going to have, but then on the other hand, I'm thinking I don't know what I'm going to do to keep her entertained for those weeks. I'm hoping the pool will be enough with the occasional trips to the grocery store and Target, hehe. Wow, enough about me yammering about all that fun stuff. Let's get on to more important things like what I'm going to wear on Memorial Day. I realize that this outfit isn't all blazing red, white, and blue, but it is white and with a few accessories, you could really make it red, white, and blue if you wanted. I opted for a more subtle Memorial Day look only because I really like these black lace-up sandals, and I'm kind of obsessed with my vintage brown polka dotted scarf (similar here). The best part about this look is that the dress can be found at your nearest Target! This dress is like my dream dress. 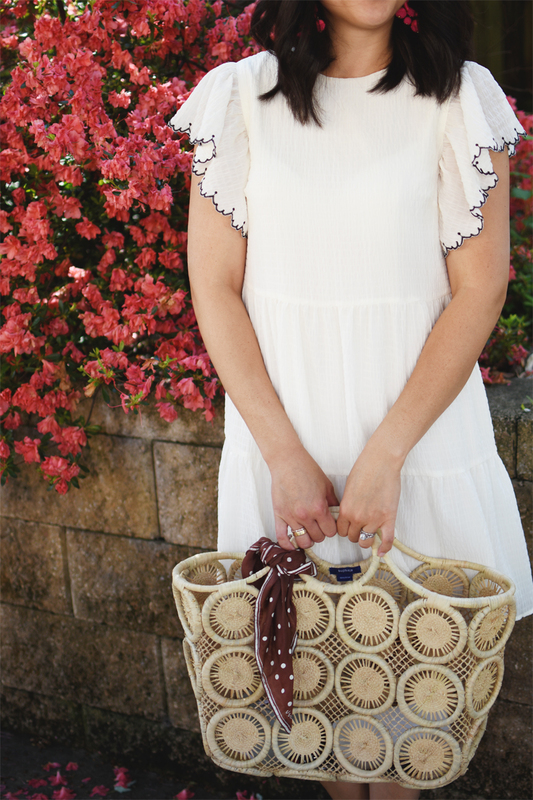 It's comfy, flattering, feminine, breezy, and it's just $35. How's that for making it easy to get your Memorial Day outfit ready. Seriously, I cannot stress how amazing this dress is and if you're a smart cookie like I think you are, you'll go to Target.com or your nearest Target and pick one up. You won't be disappointed! Photos by my friend Caitlin of The Mama Notes.